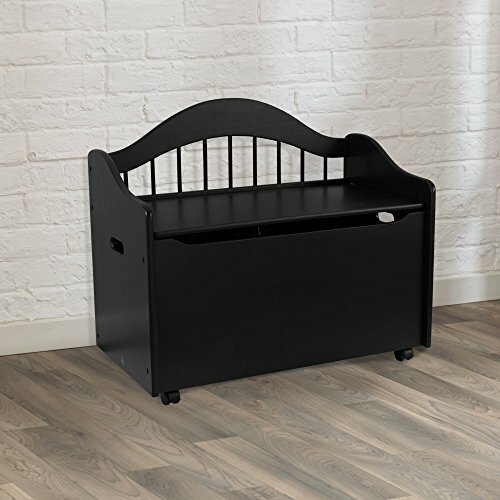 The elegant Storage Chest Toy Box is an elegant addition to any kids room or nursery. With simple lines and subtle curves, this sturdy toy box is built for safety. A unique safety hinge prevents the lid from dropping to help protect little fingers, and the casters make it easy to position for maximum aesthetic value. Safety hinge prevents lid from dropping. Doubles as a bench for extra seating. Available in white, black, cherry, honey and espresso. Sturdy wood construction. Assembly required. Product Weight : 46.2 lbs. Assembled Product Dimensions (L x W x H) : 33.00 x 18.38 x 27.75 Inches.